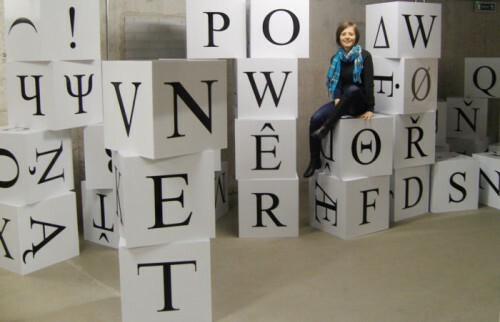 ‘Fold-ups’ is a project by Małgorzata Dawidek Gryglicka, carried out specially for Wrocław Contemporary Museum. The work consists of 40 white cubes. 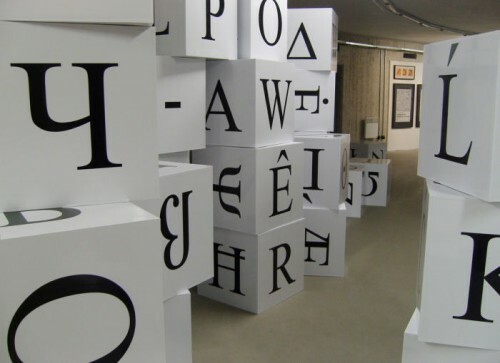 On their walls, the artist placed black letters of the alphabets belonging to the languages spoken in European Union. We can find there the signs of Latin, Cyrillic and Greek alphabets, together with diacritical marks, present in several languages. The aim of the work is to create a field for common communication. 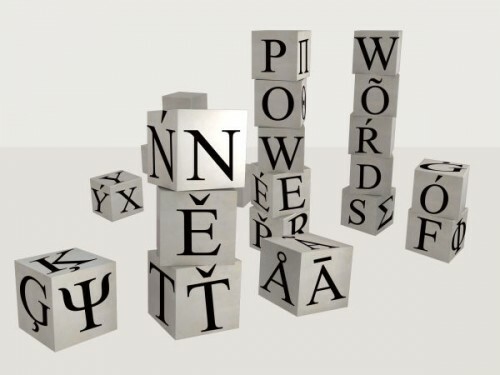 The project attempts to initiate a situation of ‘possible communication’, that would be a result of a cultural integration basing on a common Latin-Greek language platform. This situation appears despite phonetic or personal barriers. The work takes the form of a game. Arbitrary parts of speech derived from one language are possible to constructively function in expressions formed in another. In this realization an important role is played by a common communication base. Moreover, the work is interactive it determines the recipient to create their own message that will be visible from a distance and legible to others. Walls of the cubes, supporting one another, play a symbolic, integrative role here. A cube without one wall, and hence without one letter, is no longer a cube. ‘A propos’ is a series of debates, lectures an meetings organized at WCM, which subjects are inspired by Polish Presidency 2011 of the Council of the European Union. Published on:4.07.12	Share:	Facebook, Twitter Małgorzata Dawidek Gryglicka (ur. 1976 ) – artystka i teoretyczka sztuki. Autorka tekstów wizualnych, obiektów tekstowych, hipertekstów w przestrzeniach publicznych i galeriach, m.in. Krótkiej Historii Przypadku (1997), DE_kodów (2003), Definicji (2005). W sztuce zajmuje się relacjami pomiędzy tekstami ciała a ciałem tekstu, językowym aspektem komunikacji, a także związkami pomiędzy słowem, jego obrazami i desygnatami. W pracach teoretycznych bada zagadnienia związane ze zjawiskami tekstu rozumianego w kategoriach dzieła sztuki. Wystawia w kraju (m.in. : Galeria Foksal, BWA Białystok, Galeria Muzalewska) i za granicą (m.in..: Museum Modern Art, Hünfeld; Stadtgalerie Villa Dessauer, Bamberg). www.dawidek.art.pl Małgorzata Dawidek Gryglicka (1976 ) – an artist and art theorist. Author of visual texts, textual objects, hypertexts in public spaces and galleries, e.g. Short History of an Accident (1997), DE_Codes (2003), Definition (2005). In art, she is engaged in relations between texts of bodies and a body of text, a linguistic aspect of communication and relations between a word, its images and designations. In her theoretical works, Gryglicka investigates issues related to the phenomena of a text considered in categories of a work of art. She has exhibited nationally (e.g. Foksal Gallery, BWA Białystok, Muzalewska Gallery) and internationally (e.g. Museum Modern Art, Hünfeld; Stadtgalerie Villa Dessauer, Bamberg). Ladies and Gentlemen, In accordance with the General Data Protection Regulation (GDPR) and bearing in mind the concerns regarding your privacy, we would like to ask you for voluntary authorisation enabling us to process your personal data. By clicking “I accept” or closing the window, you will accept the conditions specified below. You also have the right to deny or limit the authorisation. 1. Your Personal Data Controller is Wrocław Contemporary Museum. 2. Your Personal Data, available for use during website viewing, will be used only for marketing purposes (automatised analysis of your website or application activity in order to determine your potential interests and connect them with the advertising offer). 3. Authorisation to have your Personal Data processed is based on art. 6.1 (GDRP), which means that the data subject has given consent to the processing of his or her personal data for one or more specific purposes. 4. Wrocław Contemporary Museum informs that your Personal Data will not be transferred anywhere. 5. Providing your Personal Data is voluntary. 6. Your Personal Data will be stored for the duration of the Museum’s current marketing strategy. 7. You have the right to withdrawal your consent at any given moment. 8. You have the right to request access to your Personal Data, correct or erase them, or demand restrictions in their processing. 9. You have the right to lodge any objections to have your Personal Data processed for marketing purposes. 10. Your Personal Data will be stored until the decision to remove or discontinue the current marketing strategy has been made. 11. If you think that your Personal Data was processed against the law (GDPR), you could lodge a complaint with the Office of the Personal Data Protection Commissioner. 12. While your Personal Data are being processed, there will be no automatised decision-making, including profiling. 13. Your Personal Data will be not transferred to any third countries or international organizations.